The vast majority of full-time employees enjoy the comfort of knowing their employer will deposit their paycheck directly into their bank account on time. But talk to any small business owner, freelancer or entrepreneur and they will all have a story about when they weren’t paid. Sometimes it’s a great client with a bad habit of late payments. Other times, the client can’t or they refuse to pay what they owe. No matter the severity, a crunch in cash flow is a problem. Unfortunately, this is a common problem in the self-employed community. So, if it happens to you, don’t take it personally. Instead, take action to get your hard-earned dollars in the bank. Here are three things I’ve learned along the way that have helped keep my clients accountable. It can be uncomfortable to talk about money, let alone ask for it. But weigh that discomfort against the discomfort of not being paid and you’ll quickly see that it’s worth following up. In most cases, the client or customer has made a mistake and will be happy to resolve the issue as soon as possible. When you do good work, they’ll want to keep you happy so you will stick around. Being persistent doesn’t mean being rude. People make mistakes and sometimes it’s only your persistence that will correct it. Call your customer with a good attitude and assume that you’re on the same team: Team Get Paid! Don’t start with hurt feelings or accusations. A bad attitude is a surefire way to make the situation more uncomfortable, loose the client, burn bridges, and miss future opportunities. That being said, there are times when you’ll need to follow through with a little more force. If you’ve done your due diligence in following up and need to turn to your last resort – inform them that you will have to take legal action. Let me repeat the most important part: this is the last resort. You must exhaust all other options first and be willing to follow through if you do threaten legal action. If you can resolve the issue outside of court, do so. But if they put baby in the corner, drag them there with you. I try to make it as easy as possible for my customers to pay me. I know of some freelancers who only accept payment through PayPal. This is easy for people who already have a PayPal account and remember the password, but for the rest of us, “set up PayPal account” becomes another task on the never-ending to-do list. This makes your paycheck vulnerable to being pushed down the to-do list with it. 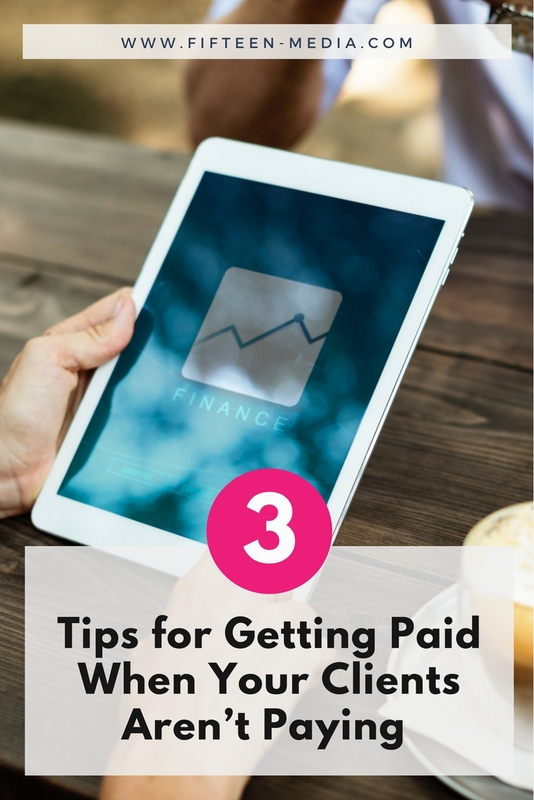 It’s the client’s burden to make sure you are being paid and still it’s to your advantage to be proactive about making it easy for them to pay you. Offer multiple options to get paid and make it clear from the beginning that you have multiple options for them to choose from. Some invoices include the line “Make checks payable to…” You can take this a step further and add other options. I’m good at PR. You’re good at what you do. And unless you’re an accountant, accounting is probably not your top skill. Despite this, as business owners, we need to keep our financial records exceptionally organized if we expect to get paid. In one case, I followed up with a client who only thought that they had paid me. They hadn’t. Luckily, (or should I say deliberately?) I had my invoices, receipts, and bank records organized to show that I had, in fact, not received their payment. Armed with this information, the client realized the mistake and corrected it. When you’re self-employed, you can’t depend on customers to pay you the way employers would. Staying organized is essential if you want to be able to chase down a late payment. At any given time, you should be able to quickly determine—at minimum—what invoices are out, which are complete, and which need to be followed up on. If this is something you really struggle with, it’s worth it to hire an accountant to take care of it for you. Most of the time, late payments are mistakes that can be quickly resolved. Make sure you have a process in place to catch late payments and follow up.